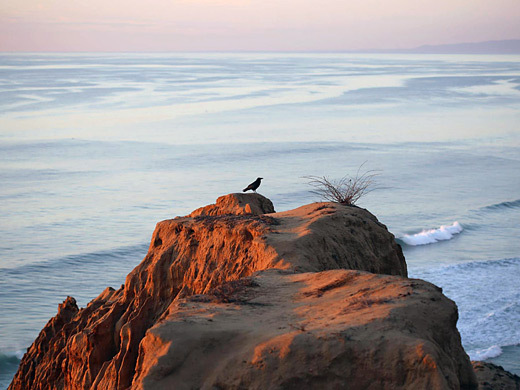 Only two small sections of the California coast south of Los Angeles have remained undeveloped and away from main roads - Cabrillo National Monument near the center of San Diego and Torrey Pines State Reserve to the north. 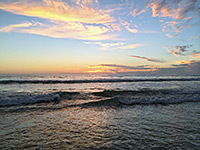 The reserve is just beyond the exclusive, modern suburbs of La Jolla, a mixture of expensive real estate, university buildings, military bases and technology companies, built on a hilly peninsula much of which overlooks the Pacific Ocean. 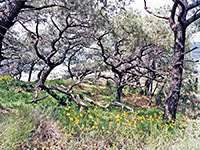 At the edge of town the land becomes quite densely wooded for a while, mostly regular fir trees but some isolated pockets of the twisted, wind-swept torrey pine - the rarest pine tree in north America, this once covered a much larger area but now survives only here and on Santa Rosa Island, near Santa Barbara. 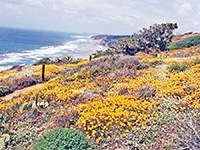 The reserve extends 2 miles along the coast and 1 mile inland and includes a wide beach, steep sandstone cliffs and bluffs that are eroded into unusual, intricate formations, and the undulating land on top which besides the trees has over 400 species of plants, flowers and bushes plus a fair variety of wildlife. Lizards are quite easily spotted, rattlesnakes, deer and bobcats less so. 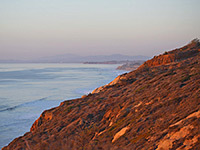 The proximity to La Jolla and San Diego can make the reserve very busy. Day use fees (2019) are between $10 and $25 per vehicle, depending on the day and the season - approaching by a steep road off S21 that climbs 300 feet from salt marshland at sea level to a parking area next to a museum and visitor center - or free for pedestrians; the woodland is criss-crossed with footpaths and is especially popular with walkers and joggers from the nearby University of California-San Diego. 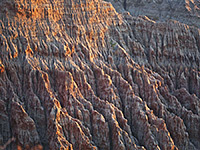 Trees do not grow as much close to the cliff edge, where the land breaks up into a series of deep ravines and promontories. 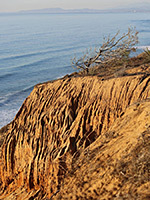 Some of the torrey pines are found here, though many have been lost to disease and fire in recent years. Flowers are abundant in spring, and several distinctive types of succulent plants and cacti grow in the reserve, such as the coast barrel cactus (ferocactus viridescens). - a 0.7 mile loop around gentle slopes through some woodland then across the top of the cliffs overlooking the ocean, which are covered by many wildflowers in spring. 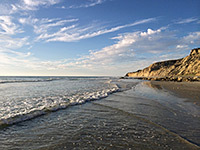 To the north, the wide sands of Torrey Pines State Beach are clearly visible, then beyond stretch the suburbs of Del Mar. - also 0.7 miles; a slightly steeper path to a promontory between two deep narrow canyons, the seaward ends of which have extravagantly eroded sandstone mounds and gullies. Most of the trees are missing from the land along this trail though some do survive right on the cliff edge and will surely fall into the sea in a few years. 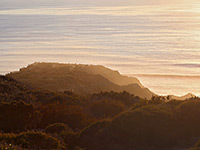 - a steeper, one mile path that provides the only access to the sea shore. The last part is quite exposed and narrow. The beach is flat, clean and empty, bordered by the 300 foot high sandy bluffs and with just a few tidepools and rocky outcrops. Residence Inn San Diego La Jolla is the top choice for long stay/all-suite accommodation in La Jolla, located in the hills towards the north side of town, right next to University of California-San Diego and just 4 miles from the entrance to Torrey Pines. The 288 rooms are split into over 30 separate buildings, between which are lawns and trees, plus an outdoor pool & hot tub at one side.